Styled with mariah longsleeve , caitlin jogger and cashmere rib beanie . Also available in Regular Length and Mid-Length. Size XXS of this colour will ship close to Jun 19, 2019. Learn More about special orders. Not as warm as it claims to keep you. Wore it today in -13 C with a wind-chill factor of -26! I started feeling a bit chilly after about half-an-hour of being outside, jumping in and out of, and waiting for, Toronto's streetcars...the label says that it's good for up to -40! Not so. However, it fits well. I got a lot of compliments! Despite what I've said, it is adequate for city living. 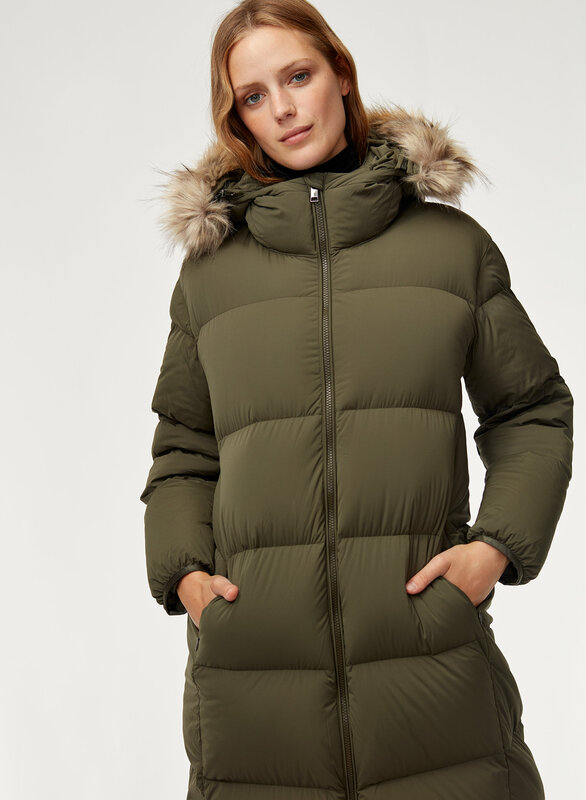 My story begins with this Park City Puffer that I was quite excited to purchase. Unfortunately the double ended zipper did not function as it was supposed to and wouldn't lock into place, allowing the bottom zipper head to continue climbing up as I walked. Not ideal & not how a double headed zipper works. SO I had to exchange this jacket twice with the same issue before going in store to find out from a manager that "this is just how they are". 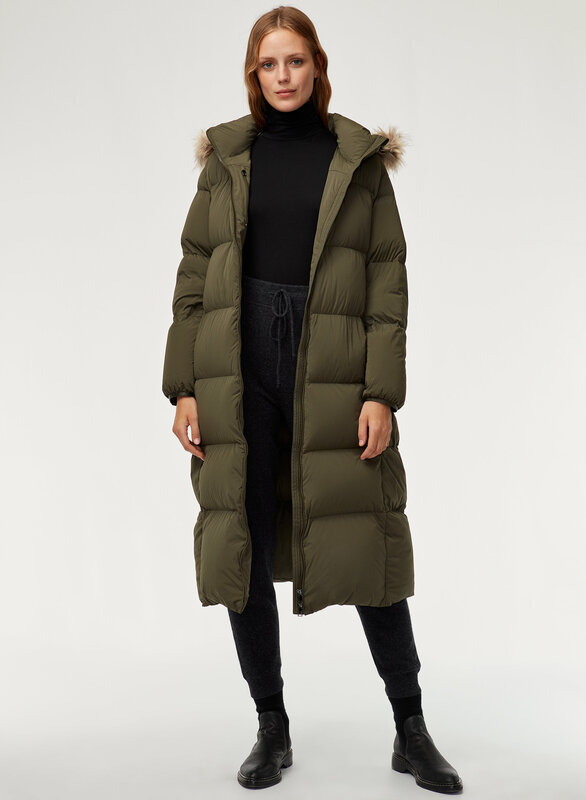 This explanation tells me that the manufacturing of this jacket is poor and that aritzia doesn't really care. Please don't accept sub-par! It's a very BASIC function that they don't care to quality control before sending it out to the general public. Zippers are very expensive to replace (I know because I do it all the time!!). 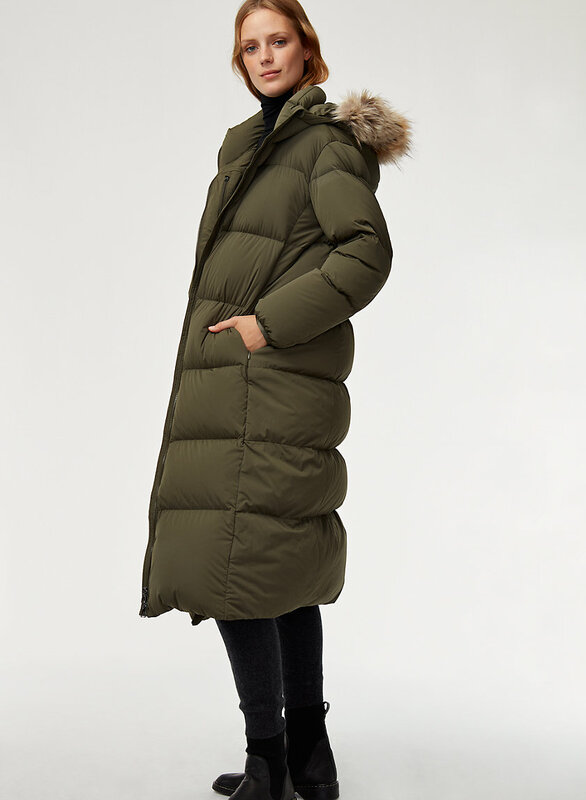 This coat is lightweight yet heavy duty with the cold. It allows for a lot of movement in the shoulders and is in no way restrictive. I LOVE my coat! I love this jacket! I’m glad I read the reviews about it fitting slightly larger and went with the XS. I’m quite tall(almost 5 9”) and the length was exactly what I was looking for (mid calf). You might run the risk of it being quite close to the ground depending on your height. We have had a few days close to -30 and I’ve found this jacket to be very warm! I love how long, comfortable and warm this coat is. It’s very light weight and easy to hang out in outdoors. It’s so warm! I got a small originally and it was HUGE on me. I would size down. I went to an Xxs. Ver hot, I like it.but too long for me.The style is very good. I haven't worn it outside yet but I just wanted to say if you're ordering online... order two sizes down. Very comfy! Able to take long walking strides even with the long length. I'm 5"2 so it was a little long for me. Also it fits bigger that you might think. I usually buy XS and even that seemed huge on me. The quality was great though! The down is coming out. It's warm but it's not that warm. It’s super warm, very light and so comfortable! Best winter coat I’ve ever owned! If you’re looking for warmth and comfort - you will not regret this purchase. It is very warm but also extremely light and comfortable. It also has very deep pockets - useful if you have a larger phone. If you are shorter than 5'5 it will probably be too long for you. I am 5'5 and it is only 6 inches above my ankles. Warm, cozy, and cute. Had to go down a size to get a more snug fit. Overall, great winter jacket. Super comfy and light weight. Extremely warm. Fits very big. I normally wear a L in babaton but I was swimming in the large and exchanged for a S. Fits perfect. Great at cutting through wind and insulating from the cold. 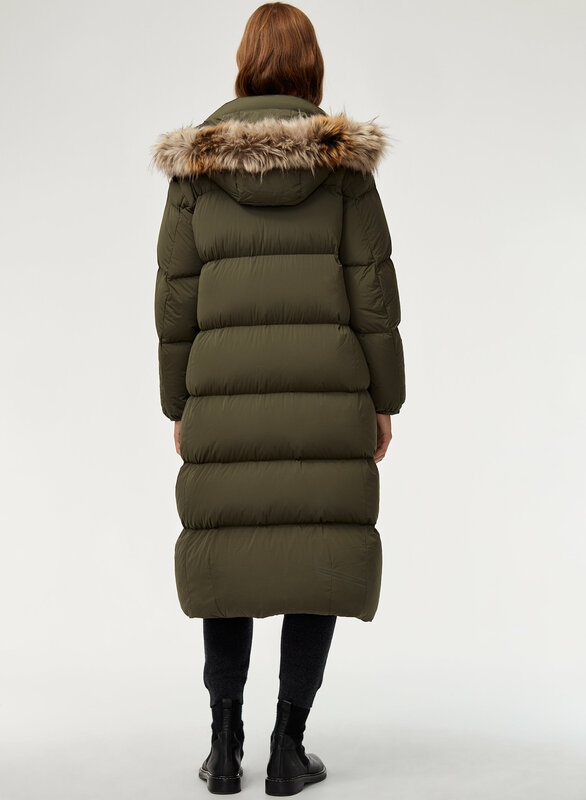 I live in northern Alberta, and have to wait for the bus every morning, this coat keeps me nice and toasty even on the days the wind is howling. 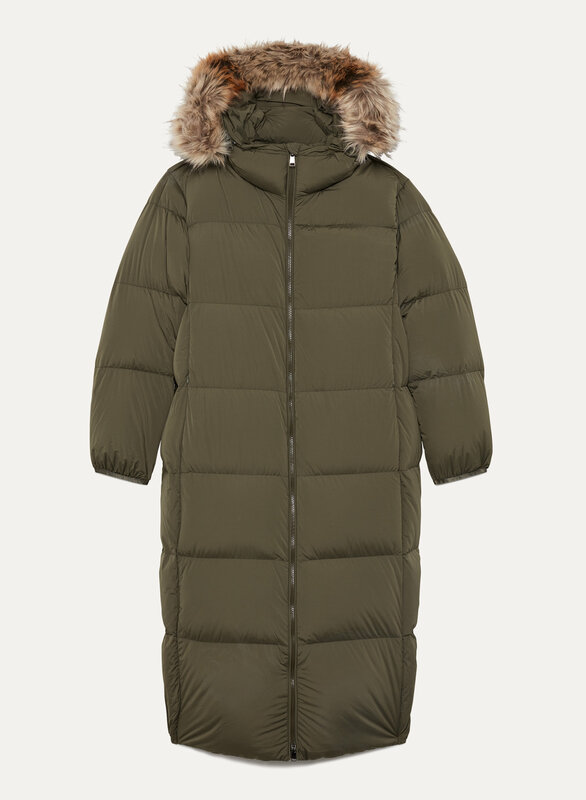 I have another parka by a Canadian company (I think we all know the brand) and it has nothing on this one. Actually can keep up to those -30 days. Size small is a bit large, but more air space means more insulation, and space for layers.